The high-class 10-furlong performer, Cirrus des Aigles, continued where he had left off in Dubai, just weeks earlier, by putting up a tremendous performance to destroy smart opposition in landing the Group 1 Prix Ganay at Longchamp in facile fashion, writes Elliot Slater. The horse who could turn out to be just about the biggest danger to Sir Henry Cecil’s Frankel, when the unbeaten star steps up to a mile-and-a-quarter for the first time, later this season, seems to be getting better with age. 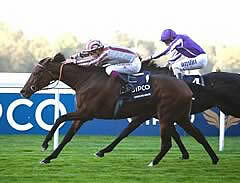 Cirrus des Aigles could certainly prove an interesting option in the horse racing betting. After defeating St Nicholas Abbey by a neck in the Group 1 Dubai Sheema Classic at Meydan, at the end of March, over 12 furlongs, the son of Even Top dropped back to his optimum trip of 10 furlongs, to make every yard of the running in the Prix Ganay on very testing ground. He eventually came home some eight-lengths clear of his rivals, under an armchair ride from Olivier Peslier. With the likes of Reliable Man, who was last season’s French Derby winner, and Wigmore Hall, a classy performer at the trip on an international level, toiling well behind in his wake, this performance from the Madame Corinne Barande-Barde-trained gelding was amongst the best in a long line of top-notch efforts. Last term, he failed by only a neck to defeat the mighty Goldikova in the Group 1 Prix D’Isaphan, before running up five pattern race successes, during a very busy season, including the Group 2 Grand Prix de Deauville and the Group 1 Qipco Champion Stakes at Ascot, in October. He got the better of the high quality, So You Think, at Ascot by three-quarters-of-a-length. With this latest success likely to take Cirrus des Aigles’ official rating to something close to 130, he now appears to be a serious danger to Frankel’s unbeaten record, if the pair do battle over 10 furlongs in the Prince of Wales’ Stakes at Royal Ascot, in June. The contest could also see So You Think and St Nicholas Abbey try their luck against Cecil’s already legendary performer. Get the most out of this summer's Prince of Wales' Stakes by placing a bet on racing.